Singapore is one of the countries that K-Pop artists visit frequently, which means there is much of K-fever and a strong fan-base in the country. We sarangkpop wondered about the current K-Pop and had a small interview with SGK-WAVE, the leading K-Pop community based in Singapore. We are the SG K-Wavers, a group of passionate Korean Wave lovers who are hoping to lead the Korea Wave in Singapore. 2. Please introduce sgkwave.com briefly. SG K-Wave is the leading Singapore based Korean Wave Community Website. Started on the 1st of January 2010, our website member base has grown rapidly, and within a year, we have grown to 6500 members and counting. 3. When and why was sgkwave.com created? As mentioned, SG K-Wave is created on the 1st of January 2010. We hope to create the biggest Korean Wave lovers community in Singapore throught SG K-Wave. Most importantly, spreading the love of Korean Wave to more Singaporean is what we are here for. 4. What has been the biggest difficulty in running the website so far? Lacking of time and trying to get more members actively involved in the community are the biggest difficulties so far. 5. Do you have Korean members or visitors on your website? 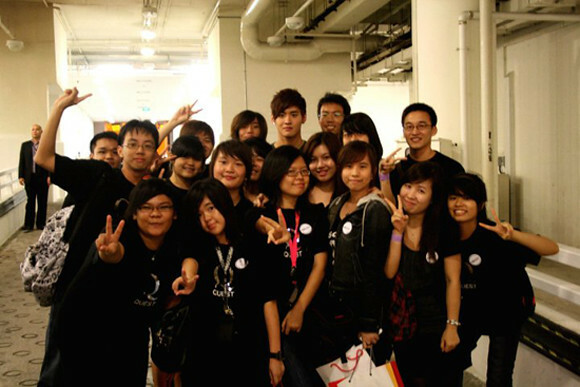 Haha, we can’t really tell but I strongly believe that we do have Korean members and visitors in SG K-Wave. 6. Do you have a special event for your website members? If so, please explain. We have been organising mini dance sessions for our members to learn some of the basic K-Pop MV dance steps and also get to know each other. 7. Briefly tell us about current K-pop in your country. The current K-pop Wave in Singapore is overwhelming. There is no way one can avoid the K-pop topic, you will at least have to hear of something korean at least once a day. Even if you are not into kpop, you would have at least heard and know who is Super Junior and SNSD. that’s how crazy it is. This is possibly due to their catchy tunes as well as the powerful dance steps accompanying them. 8. When and how was it that K-Pop was first introduced to your country? The Hallyu Wave in Singapore probably started a few years ago, when Korean dramas were first introduced. Following that, as people craved to learn more about Korean pop culture, K-pop artistes became better known in Singapore. With the rise of internet as a platform for K-pop artistes to showcase their talents in these few years, technology has enabled the internet-savvy to keep up with news and performances by overseas artistes, in turn introducing K-pop to Singapore. 9. Compared to other countries’ Korean wave, what would be special or unique in the Korean fever in Singapore. I guess in Singapore, the Korean Wave brings people of all walks of life and ages together. By that, I mean you can even see mothers at K-Pop events (which is surprising) and I dont think you can see this overseas. For example, a friend of mine, was asked to attend SS3 by her mother, like her mom offered to queue for tickets and pay for my friend’s ticket, which is really surprising. 10. A lot of dance(and song) cover videos have been uploaded to Youtube by Singaporian young people. And I find that many of them are performances of K-Pop events. Do you think dance contests play an important role in spreading K-pop? What is the largest K-Pop event? I do think that dance contests play an important role to a certain extent, it is the novelty of being able to do the exact same things as your idols do on stage, like you feel a sense of achievement to be able to do the dance moves, just like your idols would. And i mean, who doesn’t dream of being a star? So even if it is for a short 3,4 mins to dance off and feel like you’re an idol, you would still do it right? I think the largest kpop event held thus far was K-Pop Night 2010 held by Proof Label and the Mnet ultimate live last year. The two concerts were on par with each. because they have the biggest names in K-Pop as part of the line up hence, it really brought a lot of hype to the publicity and curiosity to the kpop fans. 11. Many Korean K-Pop experts think of Singapore as the hub of the Korean wave in South East Asia. Do you think this idea is convincing? If so, tell us why. 12. These days K-Pop artists visit Singapore quite frequently. I also understant that this coming July Korean Music Wave 2011, one of the biggest K-Pop concert will be held at the Singapore Indoor Stadium. I think this is all about the strong K-Pop fan-base. Why do you think kpop is appealing to Singaporian young people? Needless to say – the cute, charming, hot and talented young boys/girls. They are fresh and they have the entire package that appeals to everyone, there is definitely one K-Pop idol that suits the liking of each and every young Singaporean. 13. Which K-Pop stars are popular? For the guys, it’s undeniablely Girl’s Generation. However there are other girl groups such as Kara, T-ara, Secret who are also gaining more and more popularity. For the girls, it’ll be Super Junior, SHINee, Big Bang, 2PM. 14. Singapore has been heavily influenced by Chinese Culture due to the historical backgrounds. One of the most common languages is Chinese. And as you see, language is a central part of music. Why do you think was K-Pop able to be explosively successful in spite of the cultural and language differences? Novelty, the thrill of learning something totally different, that is not the norm. The Korean culture is also very different hence, it sparked about a huge interest and curiosity. 15. I was told that 5~6 years ago Japanese music was quite popular in Singapore. But K-Pop is dominating almost all the Asian charts now. Why do you think this happened? and super fresh. Like some of the boys are even prettier than girls. And the songs they sing about, the tunes, it super pop culture hence, they were able to dominate the charts. K-pop music has a very addictive tune/lyrics to it. It’s almost like as if they had casted a spell in their music. 16. What do Singaporian K-Pop fans most want from the Korean entertainment? Fan service from their idols, to be able to meet and get up close and personal with their idols. and of course, good music from their idols. 17. What do you personally most want from the Korean entertainment? More variety shows/dramas casting our idols and it will be the best if they are able to film some of the shows in Singapore. 18. How do you see the future of K-pop in Singapore? To be honest, I think that all good things will eventually come to an end. The novelty will die down. It’s only a matter of time. Majority of the kpop fans are in their pre-teens or are teenagers and as they grow up, their likings/preferences will change. However, if the kpop idols change and re-invent themselves to keep their fans in Singapore wanting more, the wave will defintely be staying here for a long time. 19. What do you think are the differences between Singaporean pop and K-Pop? I believe that Singaporean pop music is less emphasising on catchy tunes and dances compared to K-Pop. 20. Please introduce some of the most popular Singaporian singers to us. Stefanie Sun, JJ Lin and Tanya Chua have always been making Singaporean proud in the Music Industry. 21. Do you have special plans for K-Pop this year? If so, please tell us. 22. If there is anything else you’d like to say to Korean netizens, please do so here. We thank SGK-WAVE for the interview and hope more Korean netizens get to know about their passion for K-Pop.